Performance Space Orlando, a new art-and-theater venue on Mills Avenue, successfully eludes all categories: It’s not just a nightclub, a bar, a coffeehouse, an auditorium, or a theater company. It has elements of an art gallery, but not a typical one. “I’m not judging and jurying anything,” says PSO’s Winnie Wenglewick. “If you want the space, it’s your space.” Wenglewick, the former house manager of Sak Comedy Lab and an artist liaison and volunteer for Orlando International Fringe Festival, has transformed a tiny office building near Loch Haven Park into an explosive cultural arena open to artists of all forms. Painted concrete floors, minimal lighting, and dozens of red chairs salvaged from a now-defunct diner decorate the cozy, garagelike room. Medium-sized paintings of unusually cropped human figures hang on opposite walls. A small stereo sitting in one corner serves as the sound system. Although visually sparse, PSO promises grand ideas. “I actually wanted to do this seven years ago,” Wenglewick says. “I came to Orlando with my business degree in hand, and I wanted to open a performance space like the ones I’d seen in New York City.” Banks and financiers scoffed at her proposal. Discouraged, she suspended her aspirations—but only for a while. 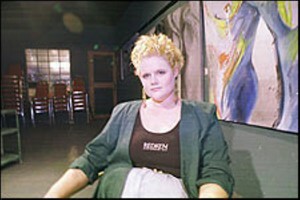 Despite a nationwide trend of alternative art spaces shutting their doors because of vanishing government and private funds, the entrepreneurial Wenglewick figured out a way to avoid financial uncertainty by opening Neon Salon, her own hairstyling salon, in the rear section of the building. “Part of the reason why I figured this place would be a little different is that I know what my income potential is as a hairstylist, and the rent here being as cheap as it is, I know that when the salon gets up and running, this will be the financial backbone.” For now, performers rent space at rates that are extremely reasonable. So far, PSO hasn’t made a profit from rental fees. That income covers utilities and Wenglewick’s time, and the majority of the ticket-sale money goes directly into the artists’ pockets. As an added bonus PSO offers free rehearsal space to performers staging a production. Neon Salon also actively participates in PSO happenings. For “Eclectic Evenings,” held on the second Sunday of each month, Wenglewick gives an impromptu haircut performance she calls Coif Art. “It’s my chance to get hair models and play,” she laughs. She sets up tables and serves white-chocolate coffee, refashioning PSO into a cabaret. Musicians, dancers, and poets provide the entertainment. Other programs include a spoken-word night called “Lip Service,” an art opening on the first Sunday of the month, a nostalgic beatnik-cafe event called “Bohemian Nights,” film-acting classes by Art’s Sake Studio, and stretching and meditation seminars. Visual artists are encouraged to submit work for the artist-of-the-month program. Although the PSO concept might seem novel, it’s not unprecedented in Orlando. Eola Theatre stood proudly, if briefly, in Wall Street Plaza. Performances ran at Manhattan South Studio Theatre, also on Mills Avenue, for years before closing, and the Central Florida Theater Alliance recently opened the Garage Theater. For PSO’s future, Wenglewick would like to bring in out-of-state performers. “I’d love to get other people in or create some kind of a network, too, where the artists that come in here can perform, and we can have artists go up to New York or California. We can get a swap of culture going on.” For now, local talent remains the first priority. THEM, an Orlando sketch- and improvisation-comedy troupe, has been PSO’s biggest draw so far. This December at PSO, Brand X Theater will present Jeff Goode’s The Eight Reindeer Monologues, a scandalous Santa Claus satire that has been selling out in Chicago. Originally published in the Orlando Weekly on November 26, 1998.